For the 2018 racing season, NASCAR imposed a new set of regulations on competitors, including limiting the number of team members allowed on the track during races. For legendary race team Hendrick Motorsports, this meant that many of the race-day crew would now need to perform their critical duties remotely from the team headquarters in Concord, North Carolina. As Hendrick Motorsports grappled with how to adjust to the new regulations Matt Cochran, head of IT, and Alba Colon, leader of Competition Systems group, saw technology as the answer. That’s when they took the proverbial wheel and made Microsoft Teams the new hub for all race communications and decision-making. Earlier this week, we joined members of the Hendrick Motorsports team in Concord, North Carolina, and at the track in Daytona, Florida, as they prepared for the exhibition race called the Clash, and for qualifying rounds for this weekend’s Daytona 500. And it was inspiring to see how they’re using Teams to connect the team across hundreds of miles. As you saw from the video, now during competitions, Hendrick Motorsports race engineers, mechanical experts, and strategists take their positions in the Team Operations Center (TOC), a new state-of-the-art facility built to optimize race-day operations. The TOC enables the team to view the on-track action, quickly gather and analyze massive amounts of data, and communicate in real-time with the team at the track. Engineers like Zac Brown, who supports Hendrick Motorsports driver William Byron on the #24 car, relies on Teams to stay in constant contact with Byron, his crew chief, and pit crew at the track. He uses Teams to easily share large files and says that because Teams is integrated with the full Office 365 suite, it saves critical seconds otherwise lost in toggling between apps. This weekend, stock car racing fans all over the country will tune in to watch the Daytona 500, an annual 500-mile long NASCAR Cup Series race known as the Super Bowl of the NASCAR race season. 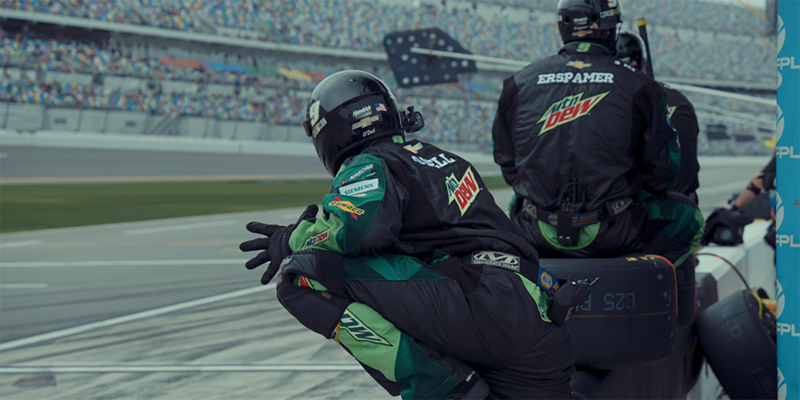 In qualifying heats, Hendrick Motorsports swept the top four spots at the starting line, and we wish them the best of luck in Sunday’s big race! Equifax and FICO are joining forces to create Data Decisions Cloud, a data and analytics suite for banks. The alliance helps recast the credit giants as alternative data providers in an increasingly competitive marketplace. Unveiled March 27, it’s a potentially lucrative deal for both Equifax and FICO, said Gartner analyst Moutusi Sau — particularly in the area of providing and analyzing alternative data, which is information gathered from nontraditional sources. Alternative data is an accelerating trend in finance. It includes looking beyond a credit score to a loan applicant’s history of meeting other financial obligations. It’s used for both credit rating and underwriting. “Equifax and FICO have both been under pressure from alternative data sources that are providing credit ratings, capturing banks as their clients and also have an appeal amongst nonbanking lenders,” Sau said. Sau added that she thinks the new Equifax-FICO partnership will enable them to target a bigger piece of the consumer market beyond FICO’s traditional enterprise market, thereby expanding their base. FICO and Equifax are known for their credit reporting, which uses consumer data and predictive models to anticipate consumer behavior, as well as providing analytics software to help enterprises manage risk, customer engagement, fraud and compliance. The Data Decisions Cloud combines the Equifax Ignite data and analytics platform with FICO Cloud applications and the FICO Decision Management Suite. The vendors’ combined suite aims to enable organizations to easily explore alternative data, uncover new insights, build predictive models and more quickly make data decisions. Equifax and FICO said they also are planning to release three prebuilt products later this year. One is a connected system for real-time access to raw data that enables the quick creation and deployment of new predictive elements and promotes data science collaboration across organizations. Sau said that product reflects the credit companies’ strategy of targeting the alternative data market “in a big way,” because it will essentially provide data feeds as a product — a hallmark of the alternative data segment. The other two planned products target compliance — markets Equifax and FICO previously have not targeted. The compliance segment has been active lately due to the increasing popularity of using alternative data for risk management. Equifax and FICO have both been under pressure from alternative data sources that are providing credit ratings, capturing banks as their clients and also have an appeal amongst nonbanking lenders. The finance industry has been undergoing consolidation, particularly with many new partnerships similar to the alliance between Equifax and FICO. An example is financial software vendor FIS recently acquiring payments company Worldpay. In this case, however, the more pertinent trend is finance organizations’ building interest in alternative data, Sau said. In July 2018, Equifax acquired DataX, an alternative data provider — its most significant foray into alternative data and a move to expand its data and analytics capabilities. Equifax and FICO haven’t been alone in moving into alternative data. The vendors’ main competitors are the big credit players, such as TransUnion and Experian, which also are riding the alternative data trend. In recent years, Transunion acquired FactorTrust and Experian bought Clarity Services — both alternative data startups. Experian’s purchase of Clarity Services added information about 62 million consumers’ alternative credit history for items such as rent and payday loans. Equifax and FICO’s combined product suite also faces competition from smaller alternative data vendors, such as Cignifi, Import.io and Quandl. Today we are shipping the first Dev and Canary channel builds of the next version of Microsoft Edge, based on the Chromium open-source project. We’re excited to be sharing this work at such an early stage in our development process. We invite you to try out the preview today on your devices, and we look forward to working together with the Microsoft Edge Insider community to make browsing the best experience possible for everyone. In this post, we’ll walk you through how the new release channels work, and share a closer look at our early work in the Chromium open source project, as well as what’s coming next. The new Microsoft Edge builds are available through preview channels that we call “Microsoft Edge Insider Channels.” We are starting by launching the first two Microsoft Edge Insider Channels, Canary and Dev, which you can download and try at the Microsoft Edge Insider site. These channels are available starting today on all supported versions of Windows 10, with more platforms coming soon. Canary channel will be updated daily, and Dev channel will be updated weekly. You can even choose to install multiple channels side-by-side for testing—they will have separate icons and names so you can tell them apart. Support for other platforms, like Windows 7, Windows 8.1, macOS, and other channels, like Beta and Stable, will come later. Every night, we produce a build of Microsoft Edge―if it passes automated testing, we’ll release it to the Canary channel. We use this same channel internally to validate bug fixes and test brand new features. The Canary channel is truly the bleeding edge, so you may discover bugs before we’ve had a chance to discover and fix them. If you’re eager for the latest bits and don’t mind risking a bug or two, this is the channel for you. If you prefer a build with slightly more testing, you might be interested in the Dev channel. The Dev channel is still relatively fresh―it’s the best build of the week from the Canary channel. We look at several sources, like user feedback, automated test results, performance metrics, and telemetry, to choose the right Canary build to promote to the Dev channel. If you want to use the latest development version of Microsoft Edge as a daily driver, this is the channel for you. We expect most users will be on the Dev channel. Later, we will also introduce the Beta and Stable channels. The Beta channel reflects a significantly more stable release and will be a good target for Enterprises and IT Pros to start piloting the next version of Microsoft Edge. We are not changing the existing version of Microsoft Edge installed on your devices at this time – it will continue to work side by side with the builds from any of the Microsoft Edge Insider Channels. When we initially announced our decision to adopt Chromium as the foundation for future versions of Microsoft Edge, we published a set of open source principles and declared our intent to contribute to the Chromium project to make Microsoft Edge and other Chromium-based browsers better on PCs and other devices. While we will continue to focus on delivering a world class browsing experience with Microsoft Edge’s user experience and connected services, when it comes to improving the web platform, our default position will be to contribute to the Chromium project. We still have a lot to learn as we increase our use of and contributions to Chromium, but we have received great support from Chromium engineers in helping us get involved in this project, and we’re pleased to have landed some modest but meaningful contributions already. Our plan is to continue working in Chromium rather than creating a parallel project, to avoid any risk of fragmenting the community. We are committed to building a more accessible web platform for all users. Today, Microsoft Edge is the only browser to earn a perfect score on the HTML5Accessibility browser benchmark, and we’re hoping to bring those contributions to the Chromium project and improve web experiences for all users. Modern accessibility APIs. To enable a better accessibility experience for screen readers, like Windows Narrator, magnifiers, braille displays, and other accessibility tools, we’ve shared our intent to implement support for the Microsoft UI Automation interfaces, a more modern and secure Windows accessibility framework, in Chromium. We’re partnering with Google’s Accessibility team and other Chromium engineers to land commits and expect the full feature to be completed later this year. High contrast. To ensure our customers have the best readability experience, we’re working in the W3C CSS working group to standardize the high-contrast CSS Media query and have shared our intent to implement it in Chromium. This will allow customers to use the Windows Ease of Access settings to select their preferred color contrast settings to improve content readability on Windows devices. HTML video caption styling. We’ve partnered with Chromium engineers to land support for Windows Ease of Access settings to improve caption readability on Windows 10. Caret browsing. For customers who use their keyboard to navigate the web and select text, we’ve shared our intent to implement caret browsing in Chromium. We’re starting to work with our Chromium counterparts to improve the accessibility of native web controls, like media and input controls. Over time we expect this work will help Chromium earn a perfect score on the HTML5Accessibility browser benchmark. We’ve been collaborating with Google engineers to enable Chromium to run natively on Windows on ARM devices starting with Chromium 73. With these contributions, Chromium-based browsers will soon be able to ship native implementations for ARM-based Windows 10 PCs, significantly improving their performance and battery life. To help our customers with touch devices get the best possible experience, we’ve implemented better support for Windows touch keyboard in Chromium, now supporting touch text suggestions as you type and “shape writing” that lets you type by swiping over keys without releasing your finger. Microsoft Edge is known for class-leading scrolling experiences on the web today, and we’re collaborating closely with Chromium engineers to make touchpad, touch, mouse wheel, keyboard, and sidebar scrolling as smooth as possible. We’re still early in this investigation, but have started sharing some ideas in this area. Premium media sites use the encrypted media extensions (EME) web standard and digital rights management (DRM) systems to protect streaming media content so that it can only be played by users authorized by the streaming service. In fact, Microsoft and other industry partners were recognized with a Technology & Engineering Emmy award yesterday for helping bring premium media to the web through this and other web standards. To provide users with the highest level of compatibility and web developers with technology choice, Microsoft Edge now supports both Microsoft PlayReady and Google Widevine DRM systems. While Microsoft Edge often gets highest resolution and bitrate video because it uses the robust hardware-backed Microsoft PlayReady DRM, there are some sites that only support the Google Widevine DRM system. Sites that rely on hardware-backed PlayReady DRM on Microsoft Edge will be able to continue to stream 1080p or 4k with high dynamic range (HDR) or Dolby Vision, while those that only support Widevine will just work in Microsoft Edge for the first time. We also want to help contribute improvements to video playback power efficiency that many of our Microsoft Edge users have come to expect. We’re early in these investigations but will be partnering closely with the Chromium team on how we can help improve this space further. Microsoft Edge supports the Windows Hello authenticator as a more personal and secure way to use biometrics authentication on the web for password-less and two-factor authentication scenarios. We’ve worked with the Chromium team to land Windows Hello support in the Web Authentication API in Chromium 73+ on the latest Windows 10 Insider Preview release. While we’re participating in the Chromium open source project, we still believe the evolution of the open web is best served though the standards communities, and the open web benefits from open debate from a wide variety of perspectives. We are continuing to remain deeply engaged in standards discussions where the perspectives of vendors developing different browsers and the larger web community can be heard and considered. You can keep track of all Microsoft explainer documents on the Microsoft Edge Explainers GitHub. For example, we recently introduced the HTML Modules proposal, which is now being developed in the W3C and WHATWG Web Components Incubation Groups. We’ve heard from web developers that while ES6 Script Modules are a great way for developers to componentize their code and create better dependency management systems, the current approach doesn’t help developers who use declarative HTML markup. This has forced developers to re-write their code to generate markup dynamically. We’ve taken lessons learned from HTML Imports to introduce an extension of the ES6 Script Modules system to include HTML Modules. Considering the early support we’ve received on this feature from standards discussions, we’ve also shared our intent to implement this feature in Chromium. With Microsoft Edge adopting Chromium, we are changing our user agent string to closely resemble that of the Chromium user agent string with the addition of the “Edg” token. If you’re blocking site access on user agent strings, please update your logic to treat this string as another Chromium-based browser. We’ve selected the “Edg” token to avoid compatibility issues that may be caused by using the string “Edge,” which is used by the current version of Microsoft Edge based on EdgeHTML. The “Edg” token is also consistent with existing tokens used on iOS and Android. We recommend that developers use feature detection where possible and avoid browser version detection through the user agent string, as it results in more maintenance and fragile code. We are committed to building a world class browser with Microsoft Edge through differentiated user experience features and connected services. With this initial release, we have made a number of changes to the user interface to make our product feel more like Microsoft Edge. However, you will continue to see the look and feel of the browser evolve in future releases as we iterate and listen to customer feedback. We do not plan to contribute user experience or Microsoft service changes to Chromium, since browser vendors generally like to make their own decisions in these areas. We know that this initial release is still missing a few features that are available in the current version of Microsoft Edge. We’re in the early stages and are intentionally focusing on fundamentals as we continue to work towards a complete feature set. Over time, we will roll out new features and run experiments to gauge user interest and satisfaction, and to assess the quality of each new feature or improvement. This will help us ensure that all new features address our customers’ needs in the best possible way and meet our quality standards. Bing Search powers search and address bar suggestions by default. Windows Defender SmartScreen delivers best-in-class phishing and malware protection when navigating to sites and downloading content. Microsoft Account service and Azure Active Directory can now be used to sign-in to the browser to help you manage both your personal and work accounts. You can even use multiple identities at the same time in different browser sessions. Microsoft Activity Feed Service synchronizes your data across Microsoft Edge preview builds. We currently synchronize your favorites across your Windows 10 desktop devices running Microsoft Edge preview builds. In future builds, we will also sync passwords, browsing history, and other settings across all supported platforms, including Microsoft Edge on iOS and Android. Microsoft News powers the new tab experience, giving you the choice of an inspirational theme with vivid Bing images, a focused theme that helps you get straight to work, or a more news focused informational theme. Getting your feedback is an important step in helping us make a better browser – we consider it essential to create the best possible browsing experience. If you run into any issues or have feedback, please use the “Send Feedback” tool in Microsoft Edge. Simply click the smiley face next to the Menu button and let us know what you like or if there’s something we can improve. For web developers, if you encounter an issue that reproduces in Chromium, it’s best to file a Chromium bug. For problems in the existing version of Microsoft Edge, please continue to use the EdgeHTML Issue Tracker. You can also find the latest information on the next version of Microsoft Edge and get in touch with the product team to share feedback or get help on the Microsoft Edge Insider site. We’re delighted to share our first Canary and Dev builds of the next version of Microsoft Edge! We hope you’ll try the preview out today, and we look forward to hearing your feedback in the Microsoft Edge Insider community. As application performance management vendors introduce new capabilities for users moving big data cloud applications to the cloud, their focus often is on establishing baselines that set the stage for efficient data migrations. One APM vendor, Unravel Data, on March 26 unveiled a platform update that supports Amazon AWS, Microsoft Azure and Google public cloud IaaS deployments, and PaaS deployments on Azure HDInsight and Amazon EMR. The Unravel 4.5 platform provides a view of existing big data configurations that may have never truly been inventoried. New in Unravel 4.5 are reporting capabilities for on-premises-to-cloud applications mapping, cluster discovery and out-of-memory errors for Apache Hive applications. The Unravel platform uses predictive analytics and machine learning to create baseline views of on-premises big data application activity. The software then measures performance of big data cloud application versions so users can compare that to on-premises results. These are important steps as teams try to move nascent big data prototypes to the cloud, where they are meant to dependably drive regular operations of the organization, according to Bernd Harzog, CEO at APM Experts, an Atlanta-based consultancy focused on application performance management. The difficulty of the journey from skunkworks prototype to truly managed application is familiar in technology history, he indicated, but there are new twists. To support service-level agreements (SLAs), Unravel software monitors the big data application, and traces work throughout the software stack. Unravel, Harzog said, can tune running applications in real time. “The AI in the Unravel product allows it to learn what’s going on, and the data science behind it allows it to translate that automatically into actions to optimize the performance of the environment,” he said. We as an industry are absolutely excellent at one thing — that is, putting innovations into production without having any clue that they actually work. The larger issue the software is intended to address is that advanced technology can be easier to prototype than it is to put into daily operations. This is not the first time this has happened, Harzog said. “We as an industry are absolutely excellent at one thing — that is, putting innovations into production without having any clue that they actually work,” Harzog said. That vignette has played out again with clustered big data environments, especially as they begin to incorporate AI and machine learning approaches. “When you mix AI workloads to support business decisions, it becomes a competitive advantage for your organization, and it has to work well,” Harzog said. In targeting the move to the cloud, the latest Unravel release aims at one of the key trends of the day. Administrators of big data applications are finding it difficult to determine future cloud infrastructure requirements; in some cases, that is because they don’t have sufficient baseline information on performance of the big data apps they already have running on premises. “Problems occur that cause these apps to slow down or fail, which happens frequently,” said Kunal Agarwal, CEO and co-founder at Unravel Data. He cited end-to-end pipeline performance issues such as data skewing, bad configurations and incorrect container sizing. Identifying and fixing such flaws helps organizations establish rational SLAs for big data cloud applications, Agarwal said. For many IT cloud shops, cloud deployments are a favorable alternative to hosting big data applications such as Hadoop and Spark in their own data centers. Configuration issues, alone, are daunting for beleaguered administration staff working on on-premises bare-metal setups. Once data managers decide to move to the cloud, they have to decide which applications to move first, and Unravel performance measures can help in this, according to Harzog. In its efforts to monitor and manage big data applications, Unravel’s platform competes with software from vendors such as Cloudera, Dynatrace, New Relic, Pepperdata and others. For its part, Pepperdata also introduced software targeted at big data cloud migrations. According to John Armstrong, head of product marketing at Pepperdata, the company has begun work with analytics applications migration specialist Cloudwick Inc. on services for moving big data to AWS Cloud and others. Pepperdata’s goal is to establish baseline views of on-premises performance, to map workloads to cloud architecture and to assess performance in order to meet SLAs. Armstrong said Pepperdata’s platform provides profiles of CPU and memory requirements as they exist on premises, and then maps them to different configuration options available on the cloud, so that users can make intelligent decisions about which applications are the most immediate fits for cloud migration. On-premises configurations are mapped to cloud computing instances, which cloud providers offer in a wide — and sometimes dizzying — variety of options. Armstrong said Pepperdata software guides users through decisions based on whether they wish to opt for general-purpose, CPU-optimized or memory-optimized options. I’ve wanted to build a gaming rig for a while to see what I can do, so I built it and it performs really well.